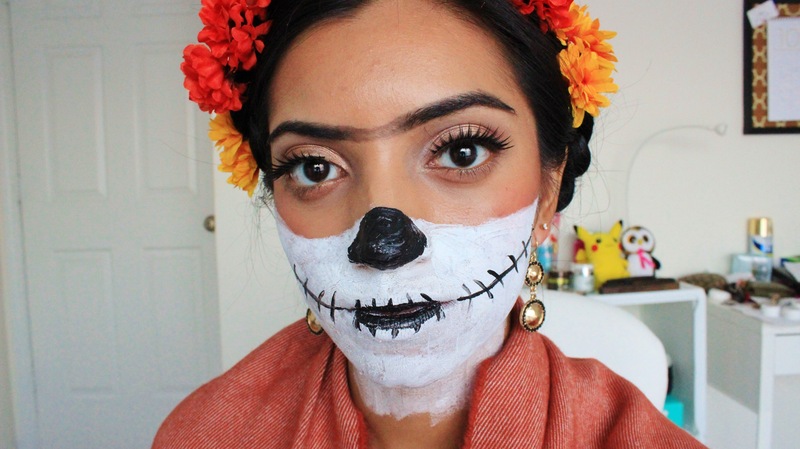 I thought it would be fun to do a Frida Kahlo inspired Halloween look, so I hope you guys enjoy. My video on how I did it is below! I already had my foundation and concealer done, so I started with my eye makeup. I primed my lids with the NYX White Eyeshadow Base. I used to NYX Dubai palette to create a gold look, with some burgundy that added depth. You can check out the video to see the exact colors. Then, I used a dark brown eyeshadow as a false liner, to add some smoke to the look. I also added some lashes from the Dollar Tree. I moved onto the distinct Frida Kahlo brows. I used my Anastasia Brow Wiz in Ebony to achieve the look. In the middle of the video, I was going to leave a little gap, but at the end, I decided to go all out and make it a unibrow. The next step is optional, depending if you want a haunted look, or just be a normal Frida Kahlo. If you want the haunted look, skip this step. It’s the contouring/blush part. In her pictures, Frida has a strong affinity for her blush, and contour/bronzor. So I used my Elf Blush and Bronzor duo to achieve this look, as well as adding more a pink blush with my Mac Blush in Pinch Me. 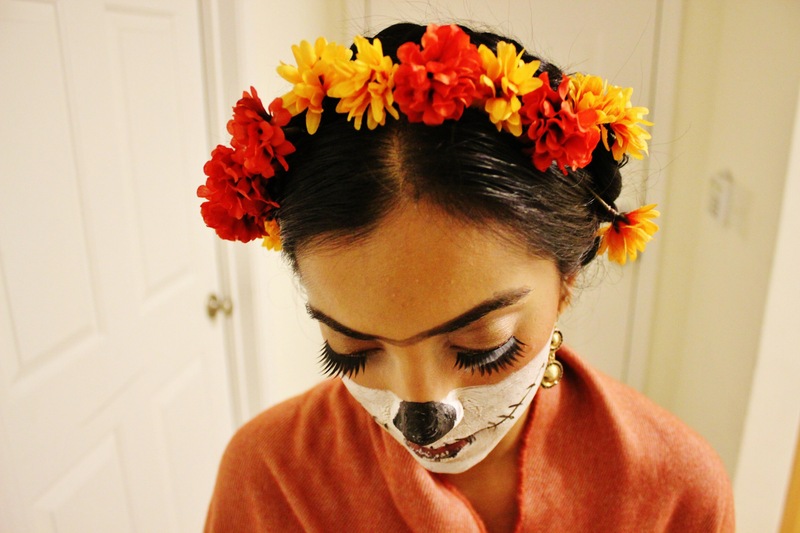 For the haunted Frida look, you need white and black face paint. I used a cheap makeup sponge and applied the white paint to the bottom half of my face and neck. As I waited for it to dry, I did my hair. I did two low pigtails, then pulled each pigtail to the opposite side and secured then with a bobby pin. If you look at (time) in the video, that’s where I do the hair. Then, I moved onto the flower “headband”. I just cut the stems off of some fake flowers from the Dollar Store and stuck then in my hair, to create a fake flower headband. It worked very well! Back to the face, I used a small, liqud liner applicator, and created a long mouth, and added vertical lines through it. I also blacked out my nose. And that’s about it for the look. My outfit was just a simple, black maxi dress. 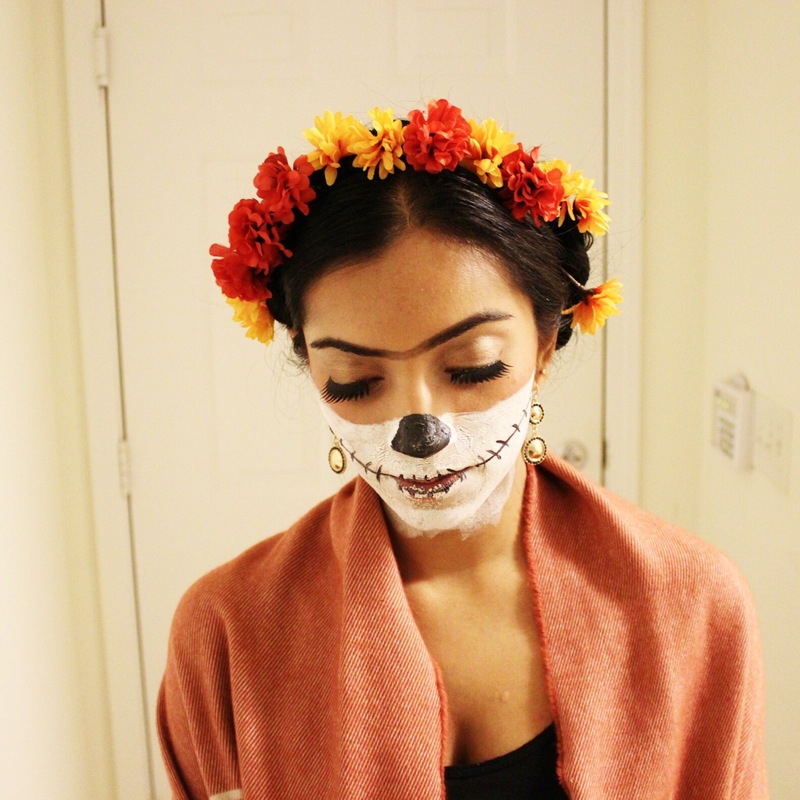 I added a large scarf, as my shawl, because Frida wore shawls a lot. I added some gold, dangly earrings and called it a day. Hope you guys enjoyed the look! Happy Halloween!